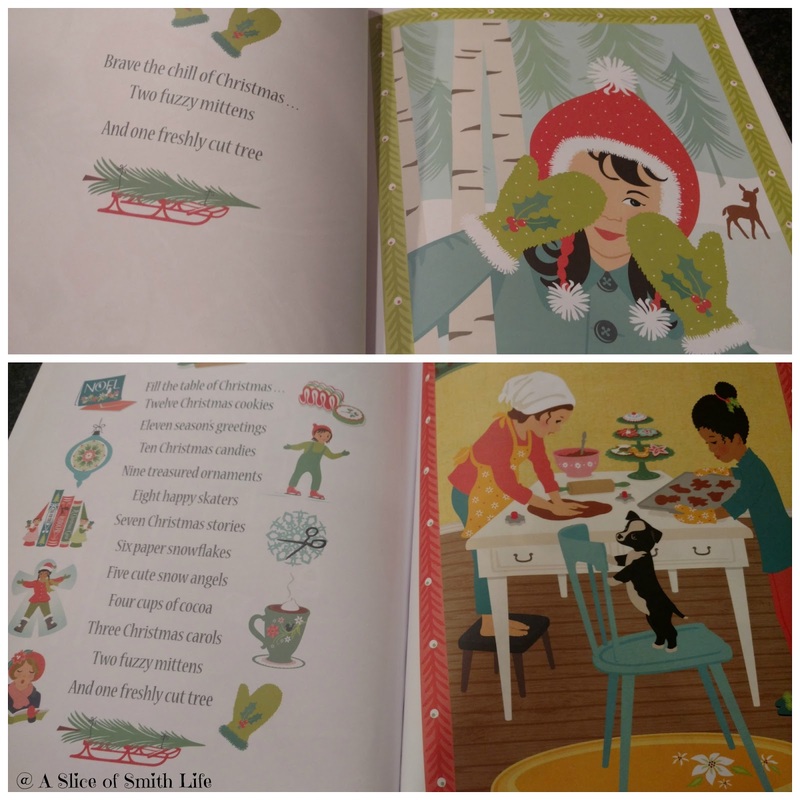 A Slice of Smith Life: O Antiphons Lapbook and 12 Days of Christmas Books! O Antiphons Lapbook and 12 Days of Christmas Books! 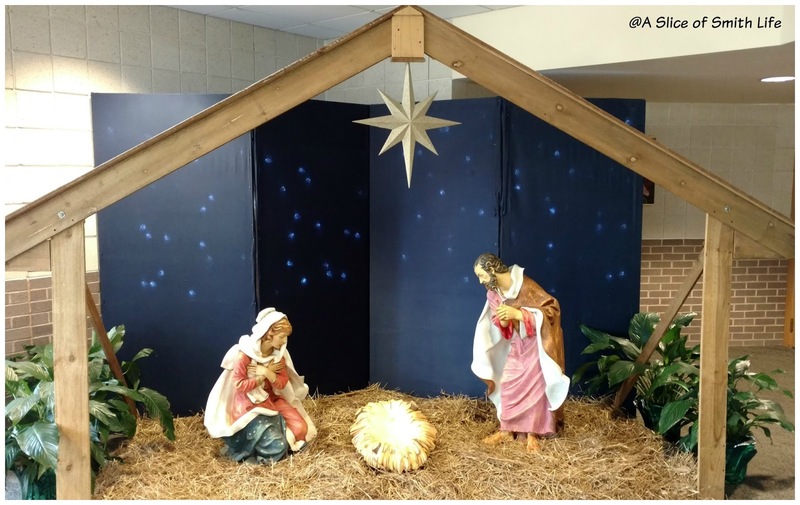 Did you know that December 17-23 are the final days of Advent and they are called the O Antiphons, which are prayers recited or sung and they are various titles for our Messiah? It was only a few years ago that I started learning more about the O Antiphons and our family is still learning about this ancient tradition. I think it's one of the many treasures of our Catholic Church and it's richness in both tradition and beauty brings out the truth, beauty and goodness of Catholicism. 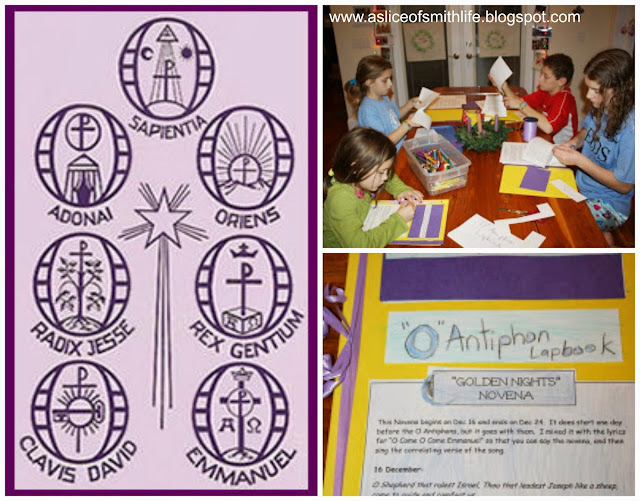 A few years ago I researched more about the O Antiphons and I pulled various resources together and we created O Antiphon lapbooks as a tool to learn more about them and to use the lapbooks as a prayer guide in the last days of Advent. You can read more details about our lapbooks. The Octave before Christmas, the Golden Nights, is when we pray the O Antiphons at Vespers and at daily Mass. To hear all the O Antiphons sung, be sure to visit Celebrating the Golden Nights. They are just so beautiful and it's like imagining what Heaven will be like surrounded by angelic song and praise. This past weekend our family made our annual gingerbread house which corresponded nicely with the O Antiphon, O Adonai (O House of Israel) . And here is O Adonai being chanted. So beautiful! Everyone has heard of the "12 Days of Christmas" song, but what days make up these 12 days? 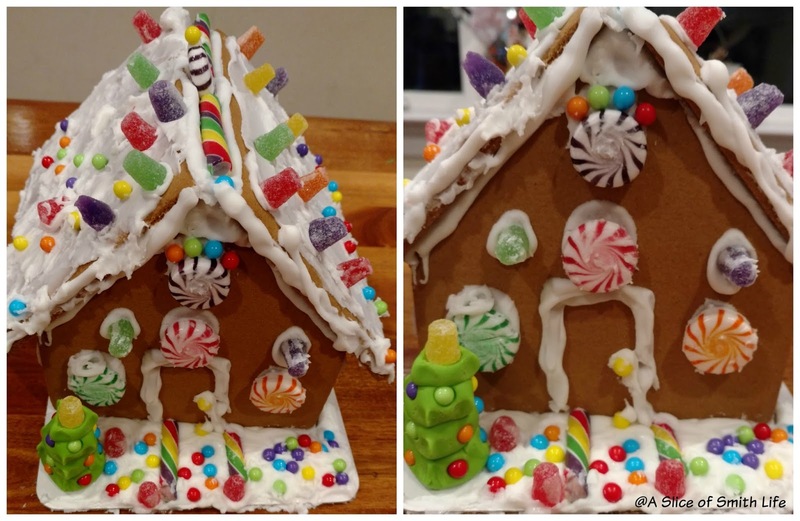 Is it 12 days before Christmas Day or 12 days after Christmas? Since we are actually still in the Advent season before Christmas Day and the Christmas season, the 12 days make up the days following Christmas Day to the Epiphany. I wrote a blog post What are the 12 Days of Christmas? that explains this further. 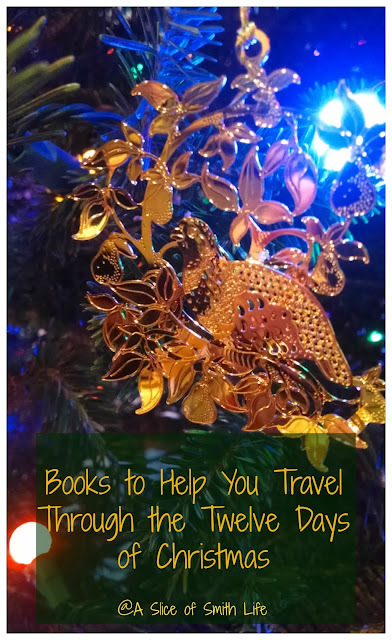 I thought I would share a great book series to help your family and friends "travel" through the 12 days of Christmas. The series of books start with "The Twelve Days of Christmas in ______". Fill in the blank with a US state (see list below) and you have a book that is fun, engaging, and educational too! 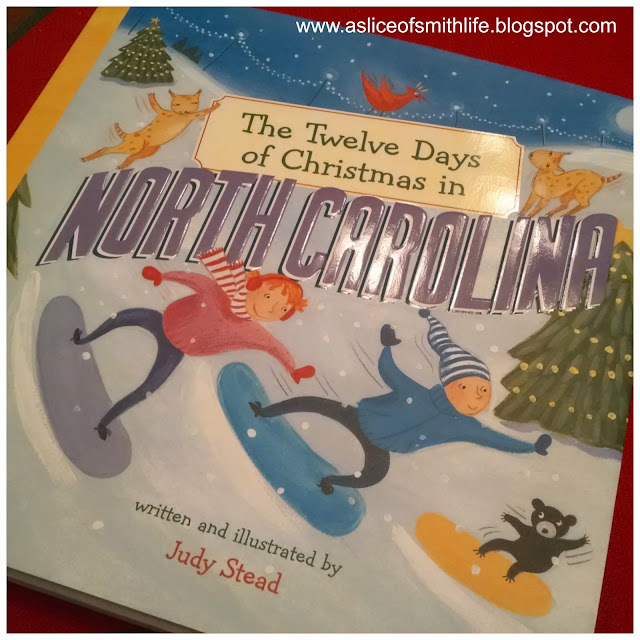 Here's a little peek into the The Twelve Days of Christmas in North Carolina book that I am giving my nieces (one lives in New York and my other niece lives in Australia) and my nephew and Godson from Pennsylvania got a book too! Each book highlights the state with the popular landmarks and cities in the particular state. The map labels what each of the 12 days throughout the book are about. I really like that this teaches geography in a fun way! Each of the 12 days is written in a letter format from a girl named Abby who is visiting her cousin, Mike, in NC. Abby is writing back home to her Mom and Dad and telling about all her NC adventures with Mike. 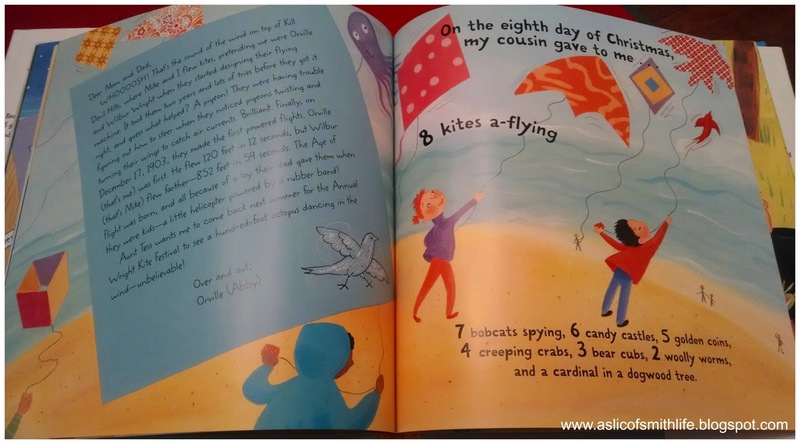 Here on the 8th day of Christmas Mike gave Abby 8 kites a-flying so Abby writes in her letter all about Kill Devil Hills, where they flew their kites. Kill Devil Hills is noted on the map above on the East Coast of NC. She then tells her parents that they were pretending to be like the Wright brothers and goes on to give facts about the first NC flight. Each page is full of color and fun facts like this. I've got the perfect suggestion! 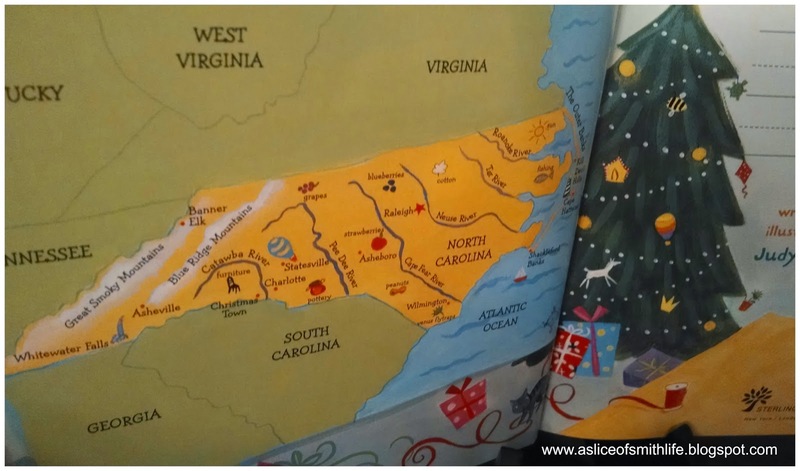 :) Here is a list of these books about other states (in alphabetical order) in case you are looking for a last minute gift idea that is fun and educational too! Don't see a particular state? I have searched Amazon for quite some time trying to find as many states as I could, but I might have missed a few along the way. Maybe if you search Amazon other states will pop up? 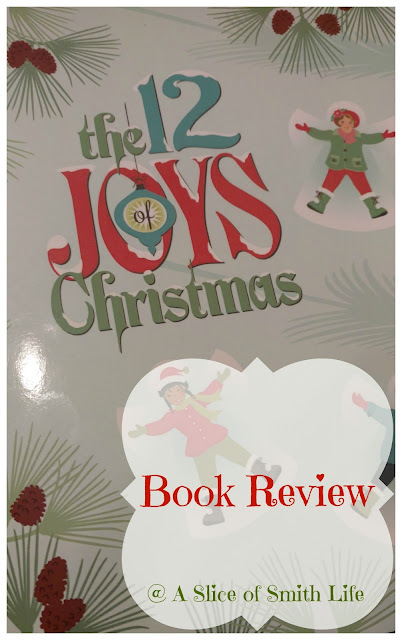 Another great book that would be a wonderful addition to your 12 days of Christmas themed books is a beautiful one I recently received to review titled The 12 Joys of Christmas. It is written in a similar format as the popular song, "The 12 Days of Christmas". 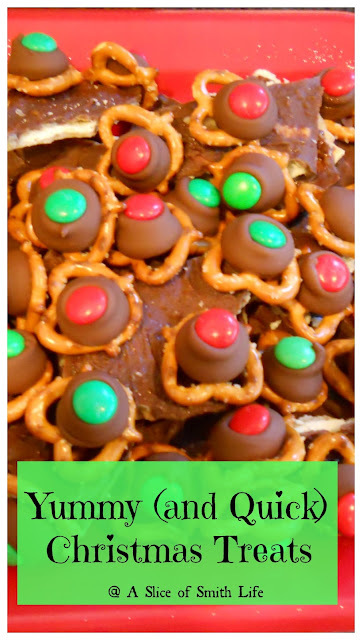 It begins with "Raise the spirit of Christmas....One freshly cut tree" and builds upon each joy of Christmas ending with "Fill the table of Christmas....Twelve Christmas cookies." Author Thomas Seibold and Illustrator Sheri McCulley Seibold are the creative husband and wife team behind The 12Joys of Christmas. Sheri is the founder and principal of Sheri McCulley Studio, a Kansas City-based design practice that develops original characters, patterns, and product concepts for a variety of manufacturers in numerous product categories. Thomas is a technology marketing specialist and manager of Sheri McCulley Studio. 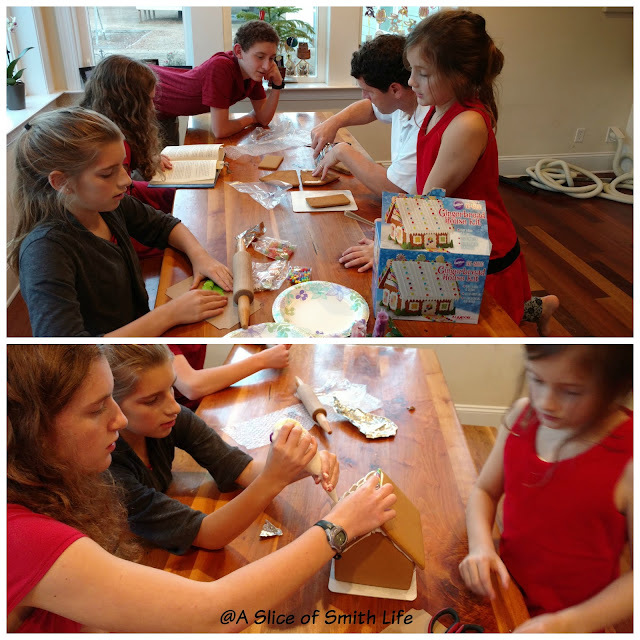 Each was inspired to create The 12 Joys of Christmas by their own fond and vivid childhood memories of the holiday season. Learn more about The 12 Joys of Christmas and Sheri McCulley’s designs at Sheri McCulley Studio. Recently my 3 year old was fussy and crying and I pulled out this beautifully illustrated book and she immediately became engaged and loved looking at all the great pictures. She enjoyed pointing to all the classical pictures and we played a "seek and find" game as I asked her to find different illustrations on each page. This book is so fun to read and helps you take in all the joys of Christmas and savor the Christmas season long after Christmas Day. The book is simple and sweet and if it can quiet my 3 year old I know it's a good book. :) The illustrations reminded me of those in The Snow Day by Ezra Jack Keats. Simple, yet full of fun and meaning. Amazon's summary of the book: "Long after the gifts are opened, the wrapping paper discarded, the toys forgotten, it is our memories of Christmas that remain. The 12 Joys of Christmas celebrates the timeless sights, sounds, smells, tastes, and feelings of a holiday that brings families and friends together in a season of shared ideals, traditions, and lasting joys. This paperback version contains the same quality printing and just as much Christmas magic as the hardcover, in a more economical format that will be no less loved by all who receive it." I highly recommend adding The 12 Joys of Christmas to your Advent/Christmas book collection and it can be given and read after the hustle and bustle of Christmas preparations and Christmas Day celebrations are over! You can purchase it at Amazon or at Shelly McCulley Studios Online Bookstore. As we continue to wait for the birthday of our Savior, Jesus Christ, our mangers in our nativity sets are still missing Baby Jesus. It will be soon on Christmas Day when I will put all the Baby Jesus figures back into each manger. Our church has a large nativity set up symbolizing the anticipation of the Christ Child being born into the world soon. 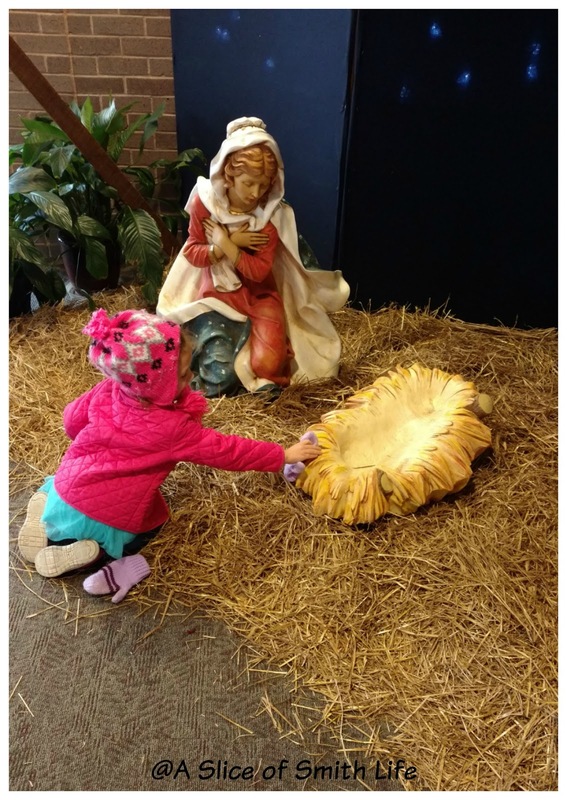 My 3 year old enjoyed staring at the nativity and I love how she is reaching for Jesus' manger, a beautiful reminder of how all of us deep down long to know Truth. We are to reach out to Jesus to be in union with Him and His will here on earth so that we can be with Him for eternity in Heaven. What a phenomenal post Tracy!!! Loaded with fun a nd info. Your family is amazing with our liturgical year feast days!! Thanks for sharing all the links, festivities and fun. I am loving those state books too! Looking into that now! Merry Christmas Chris and thanks for your visit! Glad you enjoyed the post! The state books are wonderful and fun!